Wait, weren’t renewables supposed to kill jobs and destroy the economy? Grid modernization investments are creating a construction boom across America -- largely driven by the deployment of solar. According to the Department of Energy's latest report on jobs in the energy sector, employment in the electric power sector rose 13 percent in 2016 as utilities and developers built new power plants, replaced aging equipment, and invested in new technologies to manage an increasingly complicated distribution grid. There are now 860,869 people employed in the electric power sector, an increase of more than 101,000 jobs from 2015. Workers in the construction industry building solar, natural gas and wind power plants accounted for most of the increase, reported DOE. The coming year will likely bring a 7 percent bump in employment across power generation. Coal has long been the dominant fuel for America's electric grid, but no longer. Utilities are burning less of it, and miners are digging less of it. Many politicians -- including the incoming president -- believe the decline of coal is wrecking America's economy. But the opposite is happening. Jobs are being created in new areas of the economy. There were 26,000 megawatts of new power plant capacity installed last year in the U.S. Wind provided 6,800 megawatts of new capacity, natural gas provided 8,000 megawatts, and solar provided 9,500 megawatts, according to the Energy Information Administration. "The electric generation mix in the United States is changing, driven by the transition of coal-fired power plants to natural gas and the increase in low-carbon sources of energy. This transition has required significant build-out of new power generation facilities and technologies in the United States," writes the DOE. In fact, 10 percent of all U.S. construction jobs are now serving the electric power sector. And the majority of those jobs are being created by building out renewable power plants. 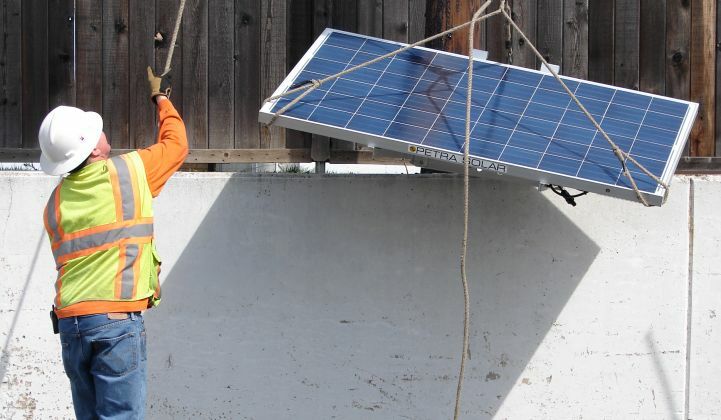 "The majority of these new jobs are classified by the BLS to the construction industry and [consist of] employees installing and building new renewable energy capacity additions," writes DOE. With 374,000 jobs, the solar industry dominates the electric power sector in terms of employment. It now accounts for 43 percent of the total workforce. Coal, oil and natural gas are the next biggest employers, accounting for 22 percent of jobs in the sector in total. Wind comes in third. 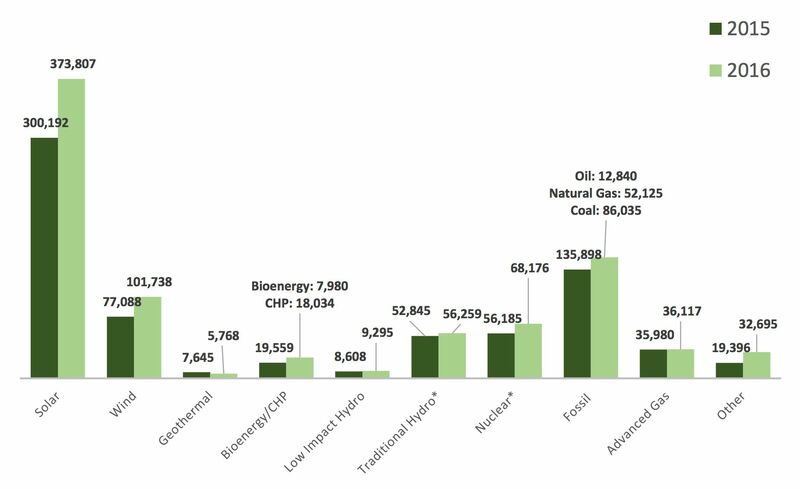 And looking outside the electric power sector specifically, there's an even bigger job creator in cleantech: energy efficiency. According to the DOE jobs report, there are now 2.2 million people working in the energy-efficiency sector. These jobs are spread across many different sectors -- and include manufacturing energy-efficient equipment, weatherizing houses, and financing projects that adhere to the government's Energy Star performance standards. A majority of jobs in this sector -- 1.4 million -- are in construction. Another 290,000 people are employed in the manufacturing sector. As President-elect Trump looks to rally Congress around an infrastructure bill, he has an obvious place to look: grid modernization and energy efficiency.